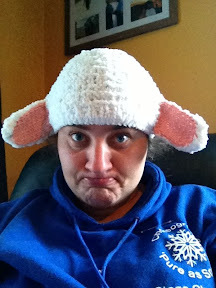 My class are currently writing and performing their own Pantomime plays- hence the pea beanie and now the lamb beanie. This one turned out really cute. I used a chenille yarn. It was cheap as chips, and gives a great look for the sheep wool effect. Cast on 70 stitches in green on 5mm needles. K2 tog, knit to last 2, k2tog. Repeat until only 2 stitches remain. K2 tog, cut yarn, thread through the last stitch and pull tight. On size 5mm needles, cast on 10 stitches in pink. P2 tog, cut thread, slip through remaining stitch and pull tight. 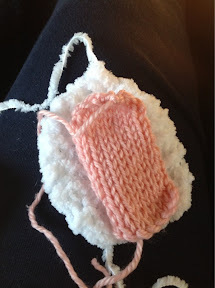 Sew the inside to the outside, because the outer ear is larger, it will curve round the front. 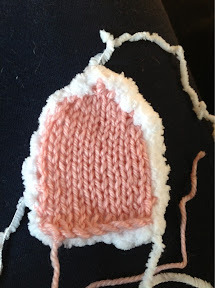 Stitch ears to the lower part of the hat. Hi, I'm a new follower from the weekend hop. Your model looks so cute. Lol.